So your veterinarian just dropped the amputation bomb? A million questions are probably swimming around in your mind and if you’re like many Tripawds parents, you probably need time to compose yourself and weigh the pros and cons of surgery for your pet. 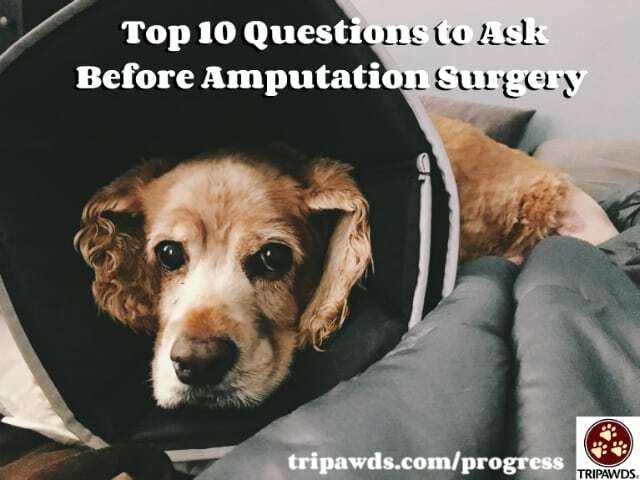 As you start to consider the possibility of amputation surgery, our Top 10 Questions To Ask Before Amputation Surgery for Dogs and Cats will give you a framework for that next conversation with your veterinary team. We don’t want to overwhelm you, so we will break this up into a two-part article. Watch this space for the rest of it on Friday. Here is a list of the most popular questions Tripawds members ask their veterinary team before surgery (or wish they had asked!). It’s by no means exhaustive so if you think of any others please share your tips in the comments below. 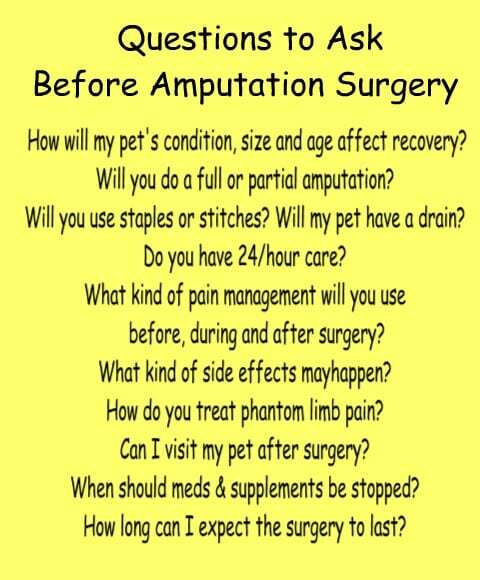 Take this list to your veterinary team. How often do you perform amputations? All veterinarians receive amputation surgery training in school, but as with anything, practice makes perfect. Find out how many amputations your vet does in a month or a year. The more the better. Veterinarians specializing in orthopedics will generally have more experience performing them on a regular basis than a general practice veterinarian. And those working in AAHA-accredited clinics will follow the most modern protocols for safety, surgery, pain management and more. If you’re not familiar with AAHA clinics, learn Why Your Pet Should See an AAHA Accredited Vet. How will my pet’s condition, size and age affect amputation recovery? Animals generally bounce back from amputation surgery in a matter of weeks, but every recovery is slightly different. Age, size and overall health condition of the animal can impact recovery. Will you do a full or partial amputation? Why or why not? Browse the Tripawds Photo Gallery and you’ll see that healed amputation sites can vary. Some animals will have a stump or scapula remaining, some will not. In our “Partial vs. Full Leg Amputation for Pets, What’s Better?” article you’ll learn the pros and cons of each technique. Will you use staples or stitches to close the incision? Will my pet have a drain put in? Why or why not? All veterinarians have their preferred method of closing a major incision. It’s good to know what to expect when you see your animal, as well as what kind of amputation incision wound care may be needed when your pet comes home. Do you have 24/hour care? Who manages the night shift and what kind of training do they have? Do you have a veterinarian on call during the weekends if we have any problems? Not all clinics offer 24-hour care. Amputation is major procedure and you do not want to leave your animal alone in a clinic after surgery. Moving your pet to a 24-hour clinic for monitoring is the next best situation, followed by a recovery in your home (which isn’t easy, but not impossible either). Work with your vet ahead of time to make the post-amputation recovery at home as easy as possible. Tune in Friday for the next five questions to ask before amputation surgery for dogs and cats.